Based on a true story…At midnight on 28 December 1864, in the Australian gold-mining town of Daylesford, young newly-wed Maggie Stuart lies dead in her own blood. Rumour and xenophobia drive speculation over the identity of her killer, and when a suspect is apprehended, police incompetence and defence counsel negligence bring yet more distortion to the wheels of justice. In fact many of the names of the characters are not changed. The first two thirds of the book deal with the murder and the subsequent 3 day trial. My research shows that the author relied very heavily on the newspaper records of the time, sometimes using them almost verbatim. This part reminded me very much of what Truman Capote called a non-fiction novel. Otto Berliner is an inspector in the Victoria Police, on leave, hoping to set himself up in the near future as a private detective. He does not attend the trial, but a friend does, and he takes notes which Berliner later finds useful. Berliner goes to New Zealand for some time and returns just a week or so before the convicted murderer is due to be executed. He is convinced that the convicted man is innocent, and so from this time, there is a race against time to see if he can discover the murderer and get a stay of exceution. I think the structure of the novel worked against the building of real tension until the final few pages. However it does present the case against the police well, as being too quick to adopt an easy solution, and too lazy to ask real questions. 2004 Whitley Award from the Royal Zoological Society of NSW for Life in a Rock Pool, Gum Tree, Creek, and Desert Dune. another Wilderness Society Award, this time for non-fiction. The Unfortunate Victim is Greg’s first work of adult fiction. 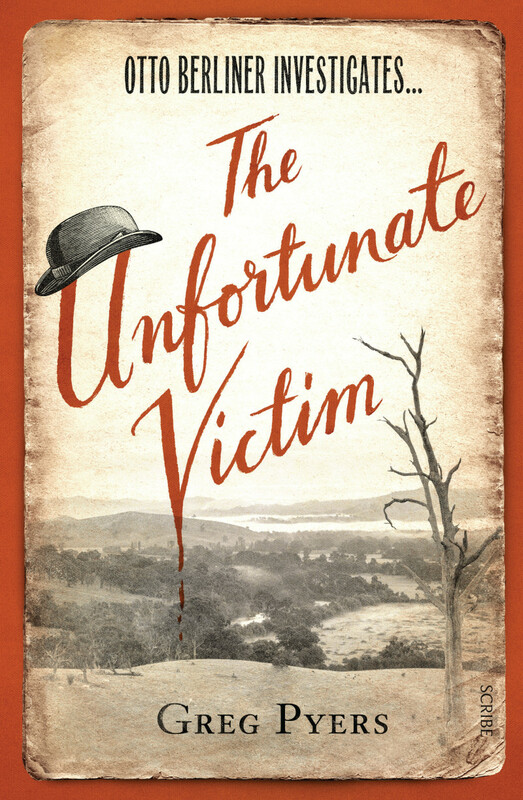 Starting at the end of 1864 and taking place in fledgling gold-mining town of Daylesford, THE UNFORTUNATE VICTIM tells the story of the brutal murder of a newly married young woman and the attempts to catch her killer. As the story unfolds readers realise the book’s title may have a dual meaning; referring both to slain woman Maggie Stuart and the man who becomes the prime suspect in her murder. We are told that the book is ‘based on a true story’ (the real-life murder of a woman called Margaret Graham) but I’ve no idea how close to the truth this book’s storyline stays as it depicts the somewhat arbitrary identification and subsequent conviction of a travelling labourer for the crime. I’m curious about which aspects of the story might be true but I shan’t say more for fear of spoilers. Here anyway the investigatory and legal proceedings suffer from a lack of evidentiary and procedural rigour but it’s easy to scoff from my 21st Century vantage point. At the time even the notion of using fingerprints as a means of identification was more than a decade in the future, let alone more advanced forensic sciences. What we – and poor Maggie Stuart – are left with is an officialdom consisting primarily of amateurs and a whole lot of guesswork. The bright spot is Detective Otto Berliner. Now working in Melbourne and proposing to become a private enquiry agent due to his dissatisfaction with the colony’s police force, Berliner has previously worked in Daylesford with much success and it is no real surprise when he is called on to assist the local police. With historical fiction the setting has to feel authentic for the story to be a success and this one does. The social attitudes, the environment, the clothing, the buildings…Pyers makes it easy to imagine oneself in the Daylesford of 150 years ago when it was a far cry from the high-end spa town it is today. And if for a moment you forget what modern creature comforts might have been missing in this era the scenes involving a delayed search in a cesspit will remind you. Rarely I have been more grateful to have been born after the invention of indoor sewerage. The publicity material for the book describes its central character as charming but I can’t say I found him so. Like many fictional sleuths he is too egotistical for that. I did find him interesting though which is why I was a bit miffed there was relatively little of him in the book. He really only plays a small part in proceedings until about the half-way point and for me that led to the book lacking a little focus. I might not have minded so much but for the setting of my expectations by the cover proclaiming this loudly to be an Otto Berliner investigation (I was muttering under my breath about him needing to show himself). On the up side though this lack of our hero in the early stages of the book does allow lots of time for the suspect pool town’s residents to be introduced in some detail. We also get to meet a local photographer who becomes Berliner’s eyes and ears for a time and I enjoyed this aspect of the book. Tom, his sensible wife and his observant son will make good regulars if this is set to become a series. My other minor gripe is also to do with the management of expectations in that this book is labelled by its publisher as a ‘cosy crime’ novel. While it does take place in the kind of socially intimate setting that label might suggest it is very definitely not a book that downplays the violence associated with crime. I know someone who only reads cosy crime novels and I cannot imagine her getting past the explicit and extensive description of the brutality experienced by the victim here. Of course there is nothing intrinsically wrong with the content of the book – it’s not gratuitous – but if a readers are led to expect one kind of thing and find another at least some of them won’t be happy. On reflection most of my very minor complaints about this enjoyable book are more to do with its publisher’s publicity decisions than the book’s content. The book itself is entertaining, the historical setting well realised and the tension – especially during the second half of the book – is quite palpable. I did not expect the resolution (which makes me wonder if it’s close to the truth) and I would happily read a future instalment of the adventures of Otto Berliner.